Only a few days after the Saudi king departed from Beijing, the Chinese capital is playing host to another Middle Eastern leader: Prime Minister Benjamin Netanyahu of Israel. 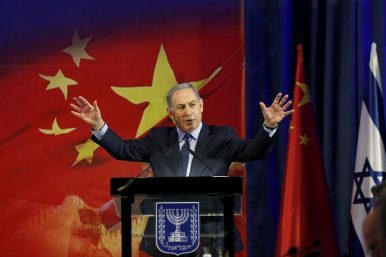 Netanyahu met with Chinese Premier Li Keqiang on Monday, followed by a meeting with President Xi Jinping on Tuesday. Generally, the relationship between China and Israel has been constrained by both distance and geopolitics. Israel is a strong partner of the United States, while China’s historic support for the Palestinian cause has also complicated ties with the Israeli government. As recently as January 2017, Netanyahu announced that Israel would be limiting diplomatic ties with countries (including China) that supported a UN resolution denouncing Israeli settlements in Palestinian territory. However, China and Israel are both keen to increase cooperation on economic matters. For Beijing, Israel is a particularly attractive partner as China attempts to become a global leader in the high-tech sector. Israel is also a potential hub for China’s “Belt and Road” initiative, given it geographic location. For now, both sides seem content to accept the necessity of more limited political and security cooperation while they attempt to harvest the benefits of an expanded economic partnership. That diplomatic approach was given a name during Netanyahu’s visit, which saw the two sides agree to elevate their relationship to an “innovative comprehensive partnership.” Innovation is the key word: it refers to cooperation on technological breakthroughs, something China is keen to do. According to Xinhua, a joint statement released by the two countries pegs a number of fields for increased cooperation, including “air pollution control, waste management, environmental monitoring, water conservation and purification, as well as hi-tech fields.” China and Israel also plan to establish “a global technology transfer center, innovation parks and an innovative cooperation center,” Xinhua reported. Netanyahu particularly expressed Israel’s interest in joining the Belt and Road, and invited Chinese companies to participate in infrastructure projects within Israel. Both he and Li also talked of advancing negotiations on a free trade agreement, with Li promising to seek to conclude negotiations as soon as possible. Unsurprisingly, there was little mention of political or security cooperation in the public coverage of the meetings, aside from noting discussions on regional issues (including Iran). There was also a brief nod to the Israel-Palestine crisis. In his meeting with Netanyahu, Li said that China had no personal interest in the Israel-Palestine tensions, but “as a common friend” of both parties “hopes to see Israel and Palestine realize peaceful coexistence as soon as possible.” He also urged both sides to hold to the “correct direction” of a two-state solution.